Freshly brewed regular and decaffeinated coffee, herbal tea, spiced cider, cocoa and chilled fruit juices. 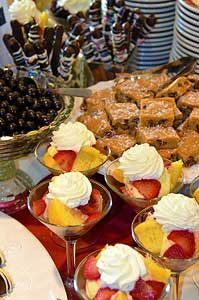 Savory vegetable and cheese quiche, sausage links, French toast casserole, variety of breakfast pastries, fresh cut fruit platter, hot beverage service and chilled fruit juice. Minimum order 20 people. A plated meal with your choice of scrambled eggs: plain, cheddar cheese, western or tomato basil with feta. Your choice of meat: bacon, ham or sausage (turkey or pork). 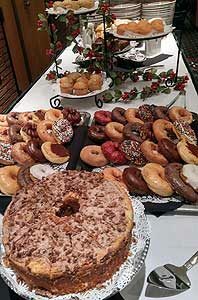 Also includes seasoned potatoes, fresh fruit, assorted pastries, hot beverage service and chilled fruit juices. Freshly brewed regular and decaffeinated coffee plus herbal tea, spiced cider and cocoa mix. 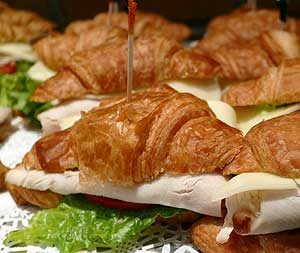 Hot beverage service, assorted soft drinks, and your choice of either a fruit or vegetable platter served with cheese and crackers. 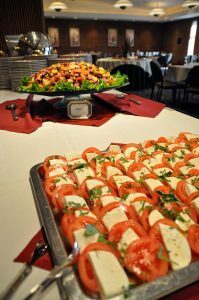 Mediterranean Break …$6.10…Hot beverage service, assorted soft drinks, homemade hummus topped with feta cheese and chopped tomatoes. Served with pita bread or crackers, vegetable crudité for dipping, and bowl of mixed nuts. * Add grilled chicken to any entrée salad for an additional $2.55. A blend of Romaine lettuce and mixed baby greens topped with Traverse City dried cherries, toasted pine nuts, red onion, blue cheese served with raspberry vinaigrette. A salad of romaine lettuce, beets, tomato, cucumber, feta and red onion served with a Greek dressing. Chicken salad served with fresh cut fruit, pickle and chips. Grilled chicken, Swiss cheese, lettuce, tomato and ranch dressing in a lawash wrap. Pan seared chicken breast served with a light lemon caper beurre blanc sauce. Rosemary chicken served with a Tuscan balsamic sauce garnished with basil Parmesan. Atlantic salmon baked and served with a creamy dill beurre blanc sauce. One beef and one chicken burrito served with Spanish-style rice and a seasonal vegetable. Breaded eggplant fried and sauced with a fresh marinara. Served atop a bed of pasta. A duo of skewered beef tenderloin and grilled chicken kabobs served atop a bed of rice pilaf with fresh vegetables. ** Item contains, or may contain, raw or undercooked ingredients. Consuming raw or undercooked meats may increase your risk of foodborne illness, especially if you have a medical condition. Scrambled eggs with a variety of toppings (cheddar cheese, diced tomatoes, basil and feta) along with your choice of two breakfast meats: bacon, ham or sausage (turkey or pork). Also served with seasoned potatoes, fresh fruit, assorted pastries, hot beverage service and chilled fruit juices. or tuna salad). Served with a variety of cheeses, breads, assorted condiments, pickle tray and chips. 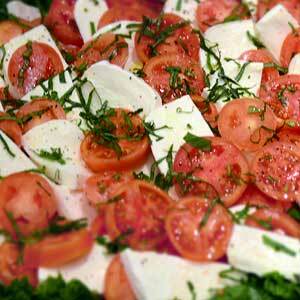 Choose two salads from the Traditional Buffet salad list below. roasted seasoned vegetables and taco salad bar. Served with fresh tortilla chips, dessert and beverage. one sauce: Alfredo, Pesto or marinara, Caprese salad, Caesar salad, antipasto salad, Italian green beans, fresh baked bread, dessert & beverage. 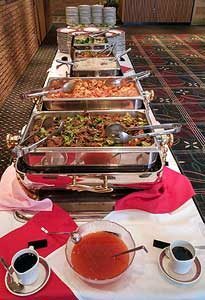 Includes beef with broccoli, sweet and sour chicken, fried or white rice, Lo Mein, steamed vegetables, spinach salad with sesame seed dressing, Dragon Noodle Salad and vegetable egg rolls with sauce. Includes beverage and dessert. Fried chicken, BBQ ribs, macaroni and cheese, corn casserole, green beans, garden salad, fruit and coleslaw. A chicken breast encrusted with a lemon Parmesan breading, baked and sauced with a sage beurre blanc. 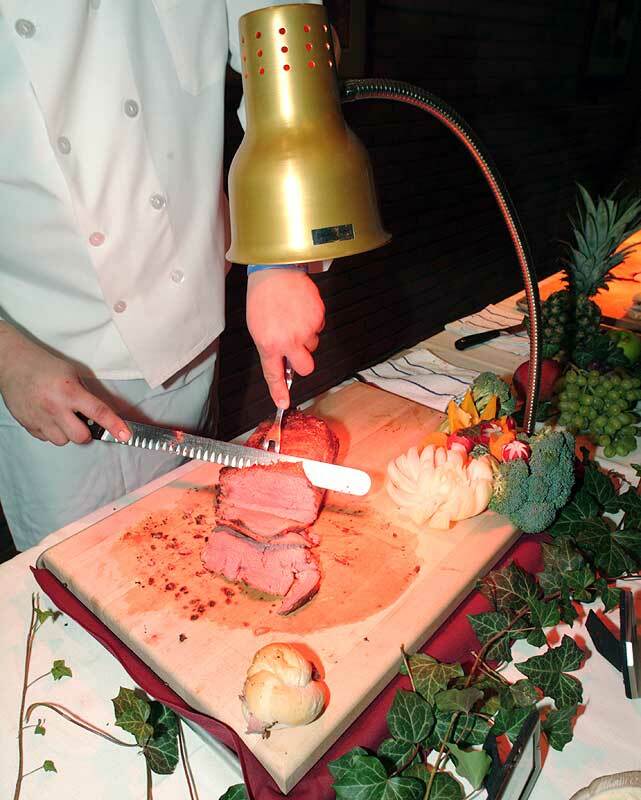 Center cut filet served with herbed brandy sauce garnished with a fluted mushroom cap. 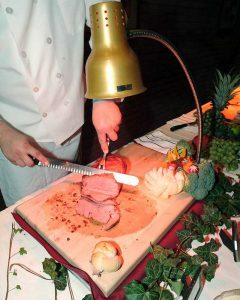 Slow roasted prime rib, served with herbed brandy sauce garnished with a fluted mushroom. U.S. Prime beef, juicy and well marbled for peak flavor. Rosemary-dijon marinated pork tenderloin garnished with a fruit chutney. Thai marinated beef tenderloin tips nestled atop a bed of jasmine rice. Accompanied by a mélange of vegetables. A tortilla filled with lentil, potato, spinach, tomato and herbs accompanied with a spicy cilantro yogurt sauce. An assortment of freshly cut seasonal fruits artfully displayed. Assorted fresh vegetable crudites and dip. 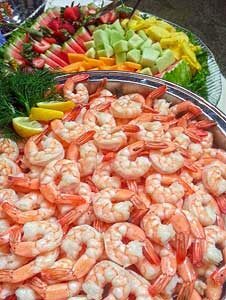 Chef’s choice variety of hot and cold hors d’oeuvres attractively displayed using an assortment of meats, vegetables, cheeses, fruits, breads and seafood (50 pieces per order). Assorted marinated olives, cured meats, cheeses and tortellini skewers. a blue cheese chive sour cream sauces. Fresh baked bread. Can be served on a platter or chef carved. including raspberry mustard, tarragon mayonnaise and a dried fruit chutney. Can be served on a platter or chef carved. Slow roasted ham with a sweet honey Bourbon glaze served with petite rolls and condiments. Can be served on a platter or chef carved. Choice of two pastas (bowtie, tri-color tortellini, assorted ravioli & fettucine) and two sauces (alfredo, pesto cream or marinara with or without meat along with a variety of toppings). Chef attended. A trio of purple Peruvian, sweet potato and Yukon gold mashed potatoes served by our chef in a martini glass with a variety of toppings including: scallions, cheddar, bacon, herb butter and chives. Select three items from below. Six pieces per person, minimum order is 20 people. Select four items from below. Eight pieces per person, minimum order is 20 people. Individual servings of vegetable and cheese quiche. Seasoned steak rolled around julienne vegetables, then sliced and served atop a spicy mustard sauce on a sesame seed cracker. For quality service, the MEC plans for one bartender and one bar waitstaff for every 50 guests.